At Barnwell Family Dentistry, we are committed to providing all of our neighbors with exceptional customer service and excellence in dentistry. We want to help keep your teeth healthy and beautiful, so you can feel good about your smile. Our professionals at Barnwell Family Dentistry maintain all dental accreditation requirements and pursue ongoing education to stay abreast of the latest trends in dentistry. All of our team members are CPR and AED certified through the American Heart Association. We have provided our biographies below so you can get to know us before your first appointment. We can’t wait to get to know you and set you on the path to a lifetime of good oral health. Our work is focused on prevention and education to help you enjoy healthy beautiful teeth and gums for life. We look forward to serving you and your family! He was an associate dentist at various dental practices before taking over as the owner of Barnwell Family Dentistry in July 2012. Dr. Sáenz recognizes the tradition of exceptional dental care that was provided by his predecessors since 1954, and he intends to continue the tradition of providing local families with the best possible dentistry with the help of his excellent team. Dr. Sáenz is a member of the South Carolina Dental Association, American Dental Association, the American Association of Endodontists, the Academy of General Dentistry, and the American Dental Society of Anesthesiology. 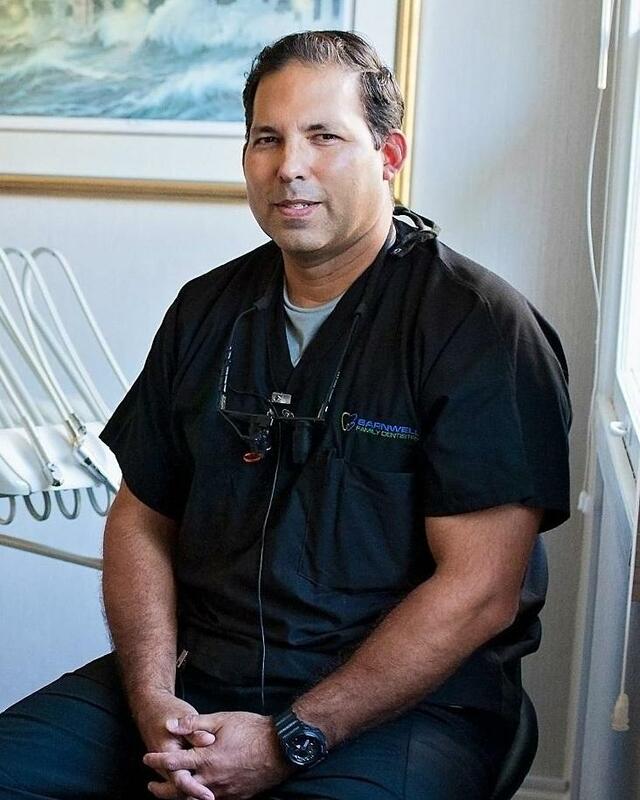 One of the best parts of his work is educating patients about their oral health and how it impacts their overall health, as well as helping them overcome a fear of the dentist and giving them a smile that is functional and aesthetically pleasing. He married his wife, Catherine, in 2006, and together they have a daughter named Gisele. In his free time, he enjoys spending time with his family, hunting, and studying the Bible. Amber was born in Pima County, Arizona, but raised in Asheville, North Carolina; she has been in Barnwell for the past 12 years. In preparation for her work, she studied data entry and medical documentation. For Amber, the best parts of her work include helping and meeting new people and working with people who feel like family in a fun and happy place. Outside of work, she loves spending time with her two children and significant other, as well as close friends and family. Barnwell native Megan attended Penn Foster College for dental assisting. With the practice for four years, she loves the closeness she shares with the rest of the team and enjoys getting to know patients—old and new—on a daily basis. Her friends and family, who include husband Dominick and children Maddix and Winter, keep her busy outside of work. She also enjoys shopping and traveling. Barnwell native Caitlyn has been with Barnwell Family Dentistry for four years, and she still finds dental assisting fascinating. With a degree in Applied Science in Expanded Duty Dental Assisting, she is happy to apply it to make patients happy with their smiles. Caitlyn also feels blessed to have such an awesome work family with the rest of the practice team. Outside of work, she loves outdoor activities, reading, and spending time with her husband and fur babies. Originally from Allendale, Samantha has been working with Barnwell Family Dentistry patients since January 2014. She was trained at Midlands Tech in Columbia and has an Associate Degree in health science, dental hygiene. Samantha enjoys her work, helping patients keep their mouths healthy. When she’s not working, Samantha loves camping, photography, and spending time with family.